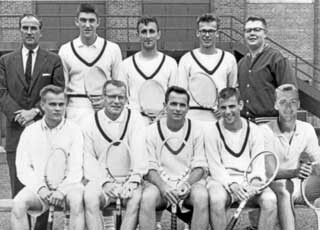 1957 Tennis Team, U of M's only national champion. * - results may be incomplete, in some seasons the only competition reported was the "conference" tournament, no team results recorded for 1894. 1895, 1896, 1906, 1917. # - Mack became ill just prior to the start of the 1919 season. Former coach A.O. Lee took over the coaching duties. 1910-1933: If players from one team swept the singles and doubles titles, that team was named champion. If singles and doubles titlists came from different teams, the team championship was shared by the two teams. 1934: Started using the point system to determine team champions. 1986-1993: Singles tournament was held but not sanctioned by the conference.